Nearly 250,000 Walmart (WMT) store associates aspiring to be a department manager will start playing a video game as part of their training. Called "Spark City," the game is an app that lets players create their own avatar and run the Dry Grocery department. The idea is to reenact a department manager's day, from the customers to the chaos. "We knew we needed a way for associates to learn in a safe environment," said Andy Trainor, senior director of Walmart Academies. "While we teach them on the sales floor still with customer interaction in a live store you're less likely to have the freedom to make mistakes because it impacts customers." 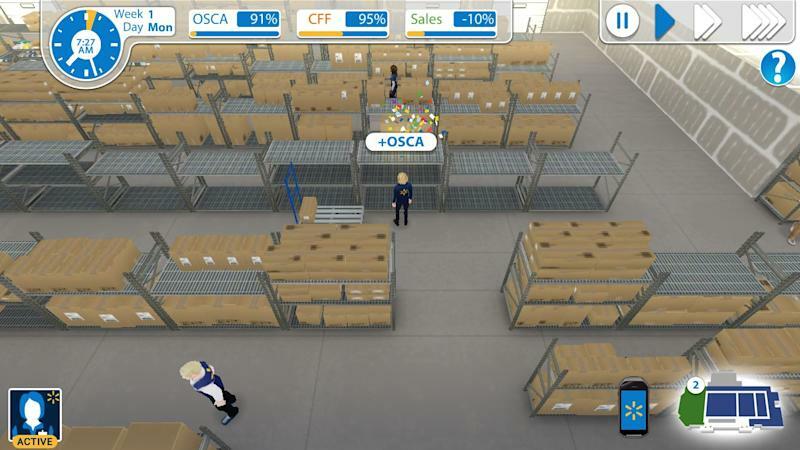 During the simulation, players must complete tasks in both the backroom and the sales floor while dealing with random events and interruptions like customer questions, vendor visits, and spills. The game tracks three key performance indicators — product availability known as On Shelf Customer Availability (OSCA), customer satisfaction also known as CFF (clean/fast/friendly), and Sales. Once a player has achieved a high enough score, they can advance to managing the Lawn & Garden department, an even more challenging environment where they have to water plants to do more customer interaction. The Spark City game has been available to the public on the App Store and Google Play since late fall. It's been downloaded more than 104,000 times and has garnered a 4.1-star rating. Spark City users can create their own avatar to learn about the Walmart department manager role. "It's definitely accurate as far as day to day tasks and drive by notes from managers while you're mid-task," wrote one reviewer. "I played and talked to another associate who had just downloaded it, and it sounded like we were talking about work so it can be a good training intro to Walmart, too. Ready for the future updates to allow promotions and more challenges so it won't become repetitive...Even though that's pretty realistic, too." Beginning in February, Spark City will integrate into the Walmart Academy training curriculum. Walmart’s Academy is a relatively new training program located in the back of 198 stores that teaches associates customer service skills, retail math, and how to use new technology. The Academy already uses technology such as virtual reality to put the associates through various in-store simulations. Daniel Shepherd, who is responsible for content creation for the Academies, started as an hourly sales associate in Dallas and worked his way through the story to department manager, assistant manager, and now works in the Walmart's Home Office. "There's a lot of things I wish I had in stores that we have now," said Shepherd. "We didn't do a great job training before the Academy program. This is a great example of a great tool to see the whole picture of how a day or week should go as a department manager." The author did something right in the backroom of Walmart in this simulation.